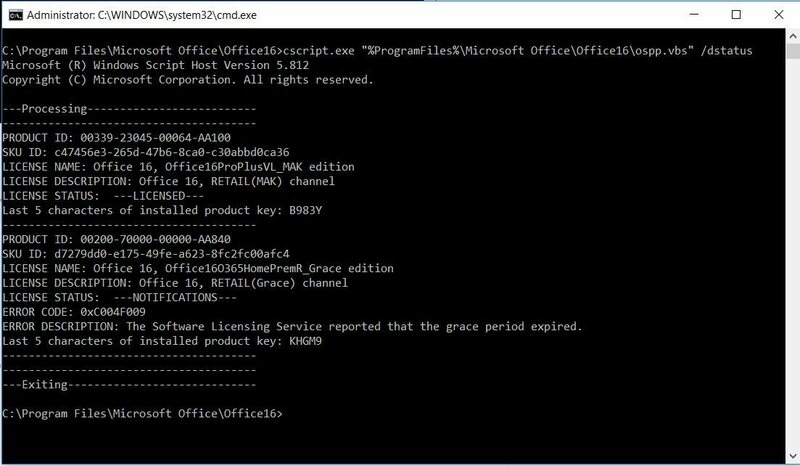 I have been having problems with Office 2016 Pro Plus Retail activation. I searched the web a lot but I could not find a solution. I would like your emergency help. Plz follow the instructions in this video and make sure you run the batch file with admin rights. Hoping you can help me. I've read through the posts and tried some of the scripts. No luck. I have a Volume license for my Office installation but keep getting prompted to activate. Here is the output from the license status script. I have gone through all of the steps to uninstall and remove Office. Manually and with tools. This Home version keeps appearing. I think I had that in my original post, but here it is. Sorry. I just want to confirm your information because you said your Office is volume verion but I see that it is retail one. Note: Make sure you run the batch file with admin rights.